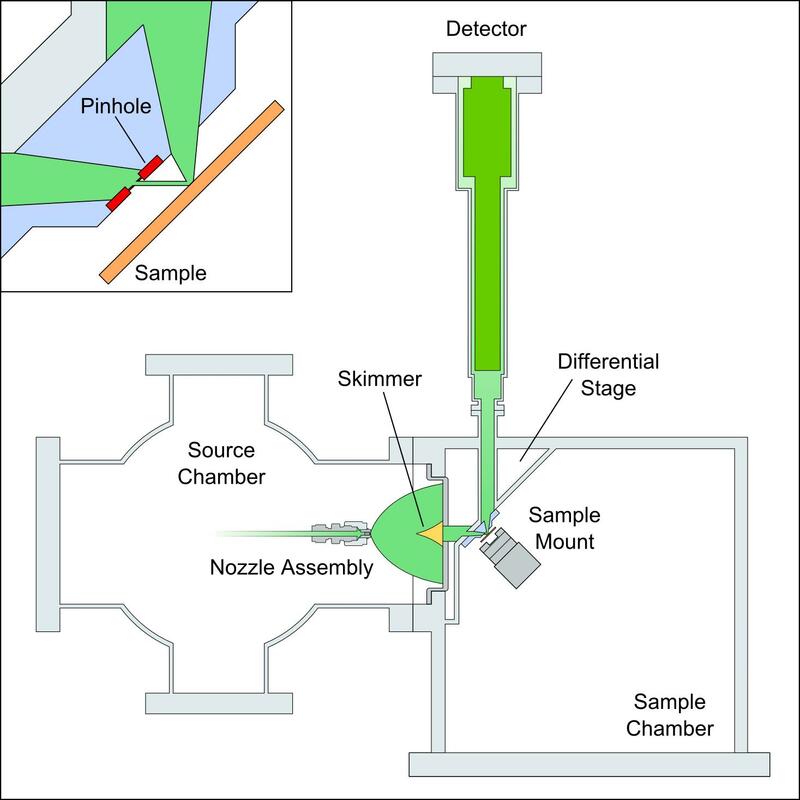 A Scanning Helium Microscope can broken down into three main components: an intense source of probe particles, optics to reduce the size of the beam illuminating the sample of interest, and a detector to capture the particles reflected off the sample surface and convert them into an electronic signal. As a scanning probe microscopy, the beam is rastered across the sample with the number of particles detected from each point on the surface forming each pixel of the final image. Utilising neutral helium provides a unique technical challenge for all three components of the microscope. Schematic diagram of the SHeM system. Using a 10 μm nozzle, a supersonic free-jet expansion of neutral helium is produced in the source chamber. A sharp conical skimmer samples the centreline of the expansion, which then passes into the differential stage. The optics of the instrument consists of a silicon nitride membrane with a ion beam milled pinhole mounted into a metal plate (see inset). The beam is incident on the back of this membrane, leaving a small spot of helium free to strike the sample. The sample itself is able to be rastered underneath the beam via three linear drives to facilitate imaging. A portion of the helium reflected from each point on the sample surface passes through a second aperture in the pinhole plate into the detector chamber, where the stagnation pressure is sampled to yield the intensity. A practical microscope requires an intense, narrow and monoenergetic source of probe particles, a feat modern atomic and molecular beam sources achieve through the creation of a supersonic free-jet beam. In a process similar to how rocket engines work, a small volume is filled with high pressure helium and allowed to expand through a small orifice (known as a nozzle) into vacuum. The resulting expansion plume accelerates the particles to speeds faster than the local speed of sound in a single direction. Sampling the centre of the expansion with a sharp conical aperture (known as a skimmer) results in a highly intense beam of helium directed at the sample, with particle counts of the order of 1020 atoms per second per steradian not uncommon. Controlling the temperature of the nozzle allows us to generate even more intense beams, as well as allowing control of the energy (and thus wavelength) of the helium atoms. Neutral particles (helium in particular) are difficult to manipulate, and as such building optics capable of focusing them to a small spot is no easy task. The size of the helium spot on the sample surface directly influences the possible resolution, making it critical for producing useful images. Groups around the world are working on focusing technologies - such as Fresnel zone plates or atom mirrors - but such options are not yet ready for implementation. In the interim, the Newcastle SHeM utilises a very simple solution - a pinhole. By taking a silicon nitride disc and ion beam milling a hole through the centre, we can directly control the amount of the helium beam which makes it to the surface of the sample. While not optimal in terms of intensity, by carefully controlling the placement of the pinhole and the dimensions of the microscope, a sufficient number of helium atoms will make it through to the detector to produce an image. The final element in a SHeM is a detector capable of taking the neutral helium flux reflected from the sample and transforming it into an electronic signal. Neutral detection, even in its most basic form, remains a significant challenge for the field of atomic and molecular beams, as a typical electron impact ioniser will only ionise one helium atom for every million that enter. Moving to quadrupoles specifically tailored to light species can increase this efficiency to a point where a SHeM becomes viable, but designing and building more efficient detectors is a priority. Currently in development is a permanent magnet solenoidal ion source which should be able to increase sensitivity by at least 4 orders of magnitude, thus allowing the SHeM to image faster, and at better resolutions.